How do we work with sellers? We begin our relationship by first getting to know you, your home, your needs, your goals and your timeline. We will meet with you at your home / property and go through a list of questions to determine how best to help you. ​At the same time we are open to questions and want to address any concerns you might have about the market and / or the process of getting your home ready for sale, what will happen while it is on the market and how we negotiate through an offer/contract. 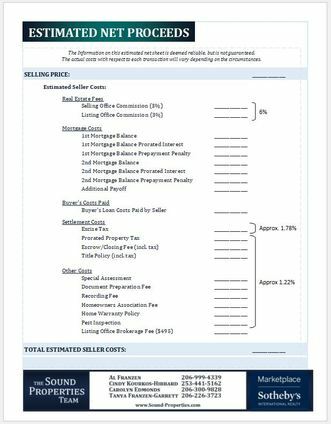 We will even go over a sample of the Estimated Net Proceeds sheet so you have a good idea of what your "Cost of Sale" is. This is a surprise to many as few agents discuss this with their clients upfront. 3 Most Important Factors in Selling your home. We provide competitive marketing information so that you can set the price for your home. Your price and motivation determine whether your home sells quickly or sits on the market for a long period of time. You control both the pricing and your motivation. A buyer’s first impression of your home’s condition (positive or negative) can determine whether or not you receive offers. Your home must also be available and easily accessible to agents on short notice within reasonable hours. Our team of licensed agents aggressively exposes your home to agents and buyers until it sells. Our proven business action plan includes steps to list, market, and close your sale. We are proactive, contacting buyers about your home. We keep you informed every step of the way. What do buyers want most when looking for the next home? How do buyers go about choosing a home to put an offer on? Where do buyers first look to find homes? How do I get the most money for my home in the current Real Estate Market? What makes the difference between an average agent and an excellent agent? Most reactive agents follow the “3 P” rule : Put in MLS, Put up sign, and PRAY for a buyer. PROMOTE your home aggressively to agents, neighbors, potential buyers, and on the internet. COMMUNICATE clearly and often as to the status of the process.